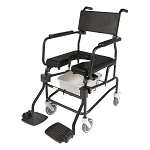 Bariatric Bath Chair from IndeMedical.com features a comfortable blow-molded seat with integrated handles for additional support. 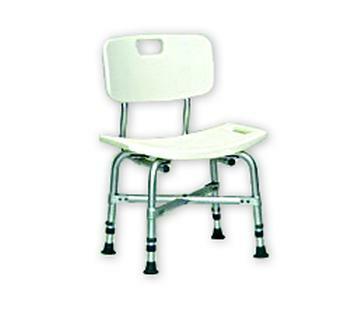 With a dual cross brace for extra stability, the bath chair accommodates users up to 500 lbs. 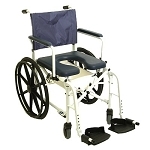 Additional features include high-strength aluminum frame to prevent rusting, suction-cup feet for securing the bench in the bathtub, and height adjustable. Extremely durable welds. Comes completely assembled. Bath chair is available with or without back. Overall Width: 18" x 17.5"
Q: What is the weight capacity ? What is the seat height ? What is the seat height? Adjustable from 16" - 20.5"